Home » Safer Homes » Safer Kitchens » What is the Best Toaster for Elderly People? Safe and Easy Cooking for Breakfast and More! As our bodies age, some daily tasks can become dangerous to carry out on our own. Cooking or baking are activities that fall under this category. Handling hot sheet pans or bending over to get your food from the oven can cause hazardous accidents for your elderly loved ones. Even toasters can present hazards for seniors. So, here are the best toasters for elderly people to reduce the chance of kitchen accidents. It is only normal for seniors to want to remain independent and be able to cook their own meals. Choose the right appliances to strike the right balance between keeping our loved ones to be safe, and still being able to cook their favorite dishes. Fortunately for us, there are many kitchen gadgets available that have been designed with special safety features in mind. From microwave ovens to toasters, technology has made it easier for our elderly loved-ones –and even ourselves! – to stay safe while cooking amazing meals. Being able to cook their own food will provide your elderly loved one with a greater sense of independence while reaping the health benefits of a home-cooked diet. Investing in a great toaster or toaster oven can represent a huge improvement in a senior’s quality of life and security. How Can Toasters Help Elderly People? Being able to cook their own meals will afford your elderly loved one a greater sense of independence and accomplishment. Cooking can even become their new hobby! Toasters and toaster ovens provide a safe alternative to hot pots and pans, which can cause accidents and injuries. Nowadays, most toasters come with an array of features that allow them to cook more than just simple toasted bread. From heating crispy bagels, to defrosting waffles and pancakes, this gadgets will let your loved one choose from a variety of baked goods. Combined with different fillings and toppings, these foods can make for a balanced, hearty meal. Toaster ovens are even more versatile. A toaster oven can do the same things as a traditional oven – minus the danger. These electrical ovens will let your loved one make cakes, muffins, pizzas, cookies, and even broil chicken and other types of meat! Their small size make them easier to clean, and seniors with back pain won’t have to bend over to take their food out of the oven. Features such as timers, alarms, and automatic shut off will help keep your elderly loved one safe while they cook delicious meals. These gadgets are also useful if you eat frozen foods. Simply touch a few buttons and wait while your frozen meal heats up. After that, it’s ready for you to enjoy! These are all wonderful reasons to go on the hunt for the best toaster for elderly people. What are the Dangers of Using a Toaster? Even though toasters are electrical devices, there are still some dangers inherent to their use. Placing anything inside the toaster’s slots can lead to a severe electric shock which could even endanger your life. Letting bread crumbs accumulate inside the crumb tray can lead to a fire. Submerging a toaster in water can generate electric shocks. If your elderly loved one suffers from a neurodegenerative disease such as dementia or Alzheimer’s, make sure to keep an eye on them while they are in the kitchen. Depending on the severity of their condition, they might still be able to prepare some recipes on their own However, you should never leave them to handle any kitchen gadgets unattended. Something as simple as placing a finger or fork inside the toaster could lead to a preventable accident. If they are still in the early stages of their disease, you can cook meals together. This will allow them to have a certain degree of autonomy over their dietary choices, but your presence will ensure their safety while they cook. Gadgets that have simple settings and buttons, and feature auto shutoff systems will work best in these cases. A toaster will do exactly what its name suggests: toast bread. These simple gadgets have evolved, however, and you can use them to toast or thaw different frozen baked goods. There are also models that offer large capacities which will let you toast 4 to 8 slices of bread at the same time. However, they are still much simpler than toaster ovens, since their main function is simply making perfect toast every time. Toaster ovens, on the other hand, are bigger gadgets that have the functionalities of both toasters and traditional ovens. You can still make toast in these ovens, but you can also bake, broil, and cook a huge variety of meals. Thus, they tend to have a larger number of features than simple toasters. Auto shutoff feature, timer, and beeping alarms to ensure safety. A variety of settings –from browning levels, to bagel, and defrost features- turn a simple toaster into a versatile gadget that can be used to cook many different kinds of food. Removable crumb trays make it simple to clean your toaster or toaster oven after you’re done cooking. Large displays, buttons, or dials to make sure your elderly loved one can customize the toaster’s settings exactly to their preferences. An auto-eject wire rack will allow users to remove their food without fear of getting burned while the toaster is still hot. This sleek, modern toaster oven broiler from Hamilton Beach is a great option for your elderly loved one. Its unique Roll-Top door provides a large opening and makes it safe to reach for food. This door moves up and out of the way to allow easy access to food even while it’s still cooking. It also makes it easier to take your food out of the toaster oven and into your plate once it’s done. The Roll-Top door is removable, and makes it easier to clean the toaster oven. There is also a removable crumb tray that will make clean-up a breeze. This toaster oven features a baking pan and broil rack. 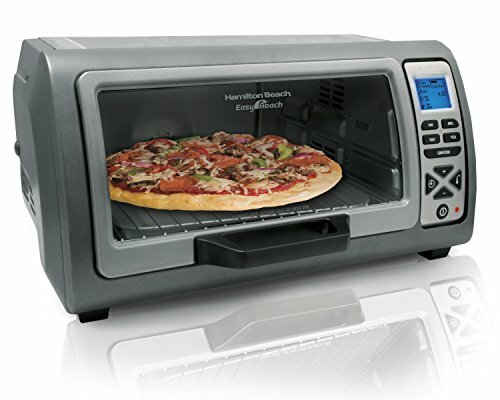 It also features five different cooking settings: convection, toast, bake, broil, and pizza. Activating the convection cooking setting will make a fan circulate heated air continuously around the food. This feature reduces average cooking time by up to 25%. This smart oven has a digital display that makes it easy to choose your desired setting. Its 60-minute timer with a ready bell and auto shutoff will keep its users safe while they cook. The reviews for this toaster oven are overwhelmingly positive. Its users highlight the numerous temperature settings that make it easier to cook many different types of food. The convection cooking setting is a great option to sear food while keeping them juicy on the inside. Many reviews also mention that the digital display is very easy to read and handle. This toaster oven is also easy to clean, which is a big plus for many buyers. The Roll-Top door is also mentioned in reviews, since it makes it easier to remove food without worrying about getting burned. Roll-Top door allows you to take your food out of the oven easily. Ready bell and auto shutoff will keep you safe while cooking. Five cooking settings maximize the versatility of this gadget. Some reviewers worry about the durability of the display. You can choose between two- or four-slice capacity models to adapt this toaster to your loved one’s needs and preferences. This toaster has a wide range (7!) different cooking settings, which will allow you to customize the level of browning on your toast. Its bagel function will also provide bagels with crispy tops and soft bottoms. It also features defrost and reheat functions, which will let you cook more than just toast! A cancel button will come in handy in case you need to stop the toaster once it’s working. This toaster features extra-wide slots, which can fit items such as sliced bread, French toast, pancakes, and other pastries. The defrost setting makes this a great option to cook frozen pancakes, waffles, and other refrigerated breads and pastries. Clean up is made simple thanks to a removable crumb tray. There is also a cord wrap hidden under the toaster so that power cords aren’t left hanging around your counter when you’re not using the toaster. A motorized, leverless lifting mechanism will ensure that your toast always pops up right in time and doesn’t get stuck. The toaster also features a digital interface with easy-to-use buttons and a countdown time for extra safety. This gadget will also emit a beeping sound to let you know when you toast is ready! These additional features make this one of the best toasters for elderly people you will find online. Buyers are very satisfied with the amount of customization this toaster allows. Its 7 browning settings are sure to provide the perfect level of toasting for everyone in the house. The leverless function is also very popular, since it provides a neat and effortless experience. The bagel setting is also highlighted in many reviews, since it really does toast perfect bagels every time. Bagel, defrost, and reheat cooking functions mean that you can use this toaster to make much more than just toast! Digital display, countdown timer, and beeping alarm ensure your safety. Some reviews mention that the toaster has “new metal” smell when you first use it – however, these reviews state that the smell goes away after the first few uses. 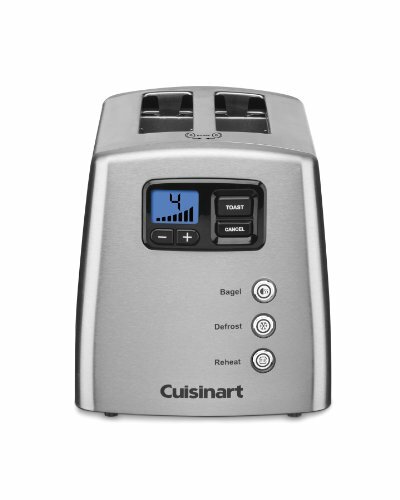 Check Today's Price on this Cuisinart Toaster by Clicking Here. This toaster is simple but will cover all your toasting needs. Choose from seven different toast shades by simply turning a knob to make sure your toast comes out exactly as you like it. It features extra-wide slots that will allow you to fit in artisanal bread, bagels, pastries, waffles, and many other baked goods. Its self-centering guides will make sure that, no matter the width of your bread, it will stay in the perfect toasting position. Cleaning this toaster is simple thanks to its swing-down crumb tray, which will keep your countertops neat and tidy. One-touch buttons will let you select your desired cooking function in just a second. The lever on this toaster can be lifted an additional inch to provide easy and safe access to your toast once it’s done. This toaster has many great reviews. Some buyers even claim that this gadget makes the best toast they have ever tasted! Several reviews highlight the fact that this will brown your toast evenly and quickly. 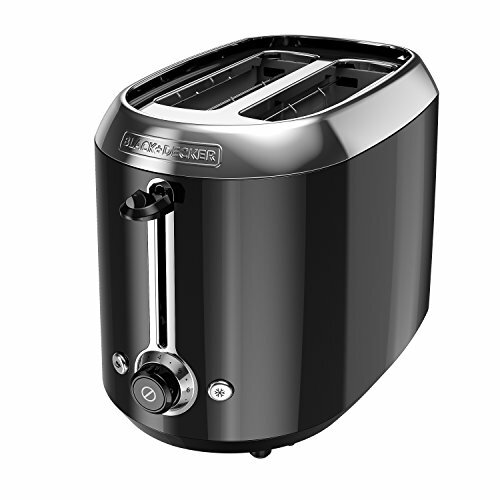 The construction and durability of this toaster also make it very popular with its users. Reviewers are very pleased with the variety of settings this toaster offers. This feature will let everyone make toast that is just right for them. The bagel setting has also received a lot of praise, since it makes this gadget more versatile than other toasters in the market. Wide slots let you toast all sorts of bread and other baked goods. A removable crumb tray will let you clean up in no time! Choose your favorite browning level from 7 different options. As with other toasters, some users report a metallic odor that goes away after using it a few times. Doesn’t include an auto shutoff feature or beeping alarm. Click Here to Learn More About This Toaster at Amazon. Unplug your toaster when not in use and regularly check the wall socket for burn marks. To clean your toaster, wipe it regularly. You should never submerge your toaster –or any other electrical gadget- in water or any other liquid. Make sure to clean your crumb tray regularly to avoid fires. Don’t leave your toaster or toaster oven unattended for long periods of time, and always make sure it’s turned off before leaving the house. Don’t place anything inside the toaster’s bread slots. So, there you have it! Some of the best toasters for elderly people. Owning a toaster or toaster oven will allow seniors to add variety to their diet and make their own meals. These are all great options, but I just love the Cuisinart CPT-420 . It is a bit pricier than some of its competitors, but the quality and amount of features mean that this will be a great investment. Of course, there are many other great options in the market. Now that you know which features to look for, it will be much easier to choose a toaster that will keep your loved ones safe while letting them enjoy cooking! Do you have a toaster that you recommend for seniors? Let us know in the comments below.